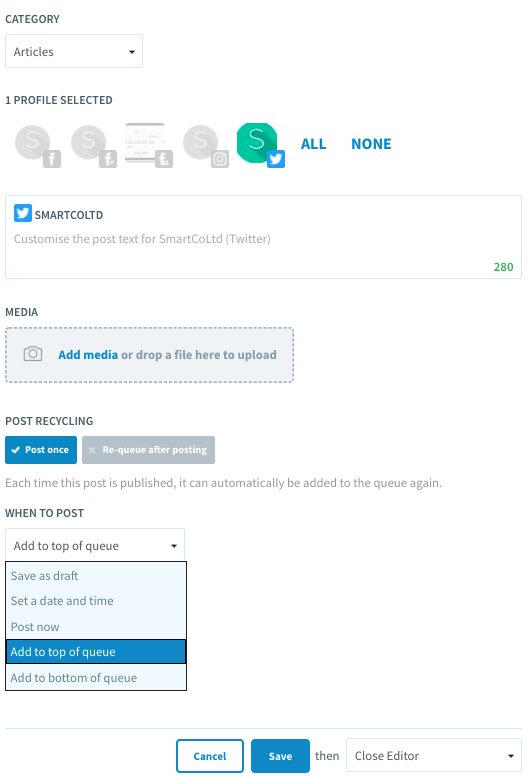 With SmarterQueue, you have ultimate control over how you add content to your Queue. You can add a post to the top of your Queue in two ways: from the Post Editor and from the Queue. Plus, you can set your default preference for adding posts in your settings. 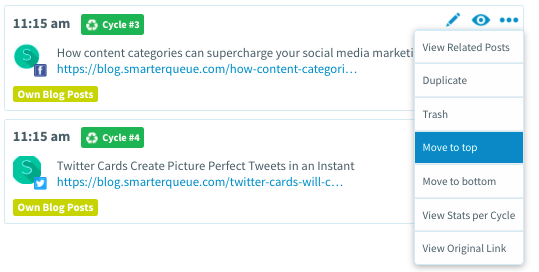 When you add a new post, you can choose whether to add it to the top or bottom of your queue or save it to drafts. If you have already added a post to your Queue and you want to move it to the top of your Queue, go to your Queue and click ... to see more options. In the menu that appears, choose Move to Top. That post will now be moved to the top of the Queue of its assigned category. Go to your Settings page to choose how you would like to add your new posts and bulk imported posts by default.